The successful launch of Discovery on Sunday March 15th after weeks of delays and the safe landing on Saturday March 28th was a clear demonstration of NASA “getting it right”. When you have a program that has the highest visibility and you suffer not one, but two tragedies that resulted in the loss of human life, vehicles and delays in the program you absolutely cannot afford anything but 100% success on every mission. 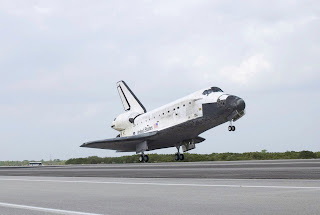 Prior to the successful launch, Discovery had been delayed several times due to mechanical and fuel related issues and inside the world’s most complicated machine any anomaly has the potential for disaster. The Space Shuttle is asked to operate at the extremes of machine performance. From high performance turbo pumps that spin at 28,000 rpm and deliver an Olympic size swimming pool worth of fuel in twenty-five seconds at -423 Fahrenheit degrees to a combustion chamber that burns the fuel at 6000 F is both impressive and frightening. Failure alone of one of the blades in the turbo pumps due to fatigue or a manufacturing defect is enough to cause loss of vehicle. The Shuttle is arguably the most complex machine humans have ever built and may ever build at least for the foreseeable future. As evidenced by this launch NASA has learned from its mistakes and mitigated the Shuttle’s risk as well as can be expected given the tasks the vehicle is asked to perform. The accidents with Challenger and Columbia could have happened on any mission and had Challenger not been buffeted by higher than usual upper level winds the slag that temporarily plugged the leak in the booster may have held long enough for the shuttle to make it past the point of danger. Had Challenger survived, the discovery of a close call may have prompted a change in minimum temperatures to launch, but likely wouldn’t have driven a booster design change or a review of the other safety issues on the vehicle. Likewise, had the block of foam that struck Columbia missed the leading edge of the wing it likely still would be classified as a “maintenance issue”. The loss of the crews of Columbia and Challenger did save lives. Mistakes were made that could have altered the outcome in both instances, but those mistakes have made the program safer. Prior to Challenger it was easy to enjoy the launch of a shuttle, but we were naïve to the true dangers and risks in operating such an extreme performance machine. Post Challenger we started to understand the magnitude of things that could go wrong that hadn’t. Post Columbia we learned a little more. What has been lost in the success and the tragedy is that we’ve flown the Space Shuttle one-hundred and twenty-five times barely half of the fleet’s designed life and behind that are the men and women who on this and every other mission made sure that the complexity of parts including the valves, engines, the miles of wiring, thermal protection system, tires, brakes, software and the other million components were safe to fly. Congratulations to the crew of Discovery for a successful mission and thanks to the thousands on the ground that make the flight a safe one.